Mike English, a Professor at Oxford's Department of Tropical Medicine, is head of the project and works as a paediatrician in Nairobi. "The World Health Organisation estimates that over two thirds of new-born deaths in Africa could be avoided by delivering essential interventions including emergency care effectively," he said. "With face-to-face training we have reached only a tiny proportion of the 2.5 million African healthcare workers. We need a system that enables everyone to access and learn the essential steps to save babies in an emergency. This is what we're aiming to do with our LIFE platform." 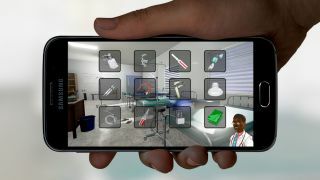 "We will make it available so that healthcare workers with a basic smartphone can download the game and learn or revise essential knowledge regularly." The campaign is also looking into virtual reality technologies to help educate healthcare workers. It's thought that the HTC Vive would be able to bring a new level of realism to the project that can't be achieved with smartphone games.